Hmm not sure where the original post to this has gone!! It published (or so I thought)!! When I participate in challenges, escpecially when I’m short of time, I tend to make cards. They are usually a quick and easy thing to make. 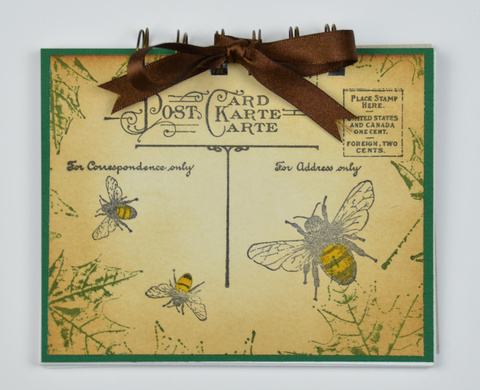 So this week I challenge you (and myself) to make ANYTHING BUT A CARD for the Stampotique designer’s challenge. I made a double journalpage in my little artjournal. I’m very curious to see what you come up with! Gorgeous vintage look... the bees and the postcard are all great images!